The Annual Representation Index Report, looking into representation of Arab citizens in the Israeli Hebrew media, reveals a substantial shift in subject matters on which Arab citizens were interviewed in the media, and a significant increase in the proportion of Arab women interviewees. The Representation Index is a project by Sikkuy, an association for the advancement of civic equality, in partnership with The Seventh Eye website and Ifat Media Research, published for a third year running. 2018 was a year of feminist protest and social movement. Arab representation in the media was well-impacted by this movement. The rate of Arab women interviewed in the course of 2018 in the Israeli Hebrew media, at 19.5% of all appearances of Arab commentators on monitored programs, is the highest since the project’s inception. Albeit far from female proportion in the population, this rate is continuing a steady increase and a substantial improvement from previous years – not two years ago, the proportion of female Arab representation in the media was 13.5% of all Arab interviewees. Alongside this improvement in gender balance, a significant change was also measured in matters of Arab coverage and representation. 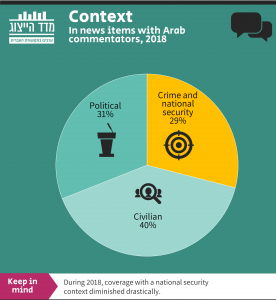 In 2018, only 5% of Arab interviewees in television and radio revolved around national security. Instead, social and political matters took center stage. The index clearly shows that the past year brought serious media discussion surrounding matters such as violence against women and femicide, as well as significant coverage of violence and crime in the general Arab society. This is viewed in contrast to the general disregard and exclusion normally characterizing past media interest on such matters. The second main theme emerging in this year’s report of Arab representation in the media, is the sweeping protest against the Nation-State Law; however, the latter focused mainly on representation and coverage of the Druze population, spotlighting retired military officers, while underplaying the majority of the Arab population. The index accordingly shows that, on the subject of the Nation-State Law, interviewees and commentators were mostly Druze – politicians or retired senior officers – while personages from the general Arab population were relatively underrepresented. This year’s top-grading current affairs shows were Channel 10’s “London and Kirschenbaum”, achieving top index ratings for representation of Arab interviewees and expert commentators for the second year running, with an exceptional average of 9.4% Arab interviewees; the Television News Company’s “Ulpan Shishi” [Former channel 2 Friday Studio] (8.6%) and Kan 11’s “Hadshot HaShavua” [This Week’s News] (7.3%). Radio programming’s first prize goes to “Seder Yom” [Agenda] with Keren Neubach and “HaBoker Haze” [This Morning] with Arieh Golan, both on Kan|Bet – Israel’s public broadcasting corporation. “Seder Yom” receives special merit for its outstanding and substantial female representation, with 61% of the Arab interviewees on Neubach’s program being women. At the bottom of the list, yet again, was Galatz [IDF Army Radio] radio station – with an especially low rate of Arab interviewees, at 1.6% – the lowest interviewee rate of all monitored radio and television channels. All in all, this year’s index has shown that 2018 carried on with the positive trend of previous years, with an increase in Arab representation, including a peak representation of 3.5% recorded for the monitored current affairs programming in the second half of 2018. The average proportion of Arab interviewees across all 21 leading current affairs programming, television and radio, monitored by the index, has increased to 4.7% – a slightly higher figure than that the previous year’s rate and 30% more than in the project’s inception in January 2016. These numbers, however, remain very low, and far from Arab proportion within the general population. Edan Ring, co-director of the Shared Society Department in Sikkuy, commented on the annual report: “This year’s Annual Report of Arab representation in television and radio is proof that, slowly but surely, the media gets that there’s a wider, more diverse spectrum of interests on which Arab citizens can be interviewed. We have seen, throughout the year, that social and political protest of the Arab society received proper airtime, with important issues afflicting the Arab society garnering their due coverage in a more meaningful, respectful manner. This used to be a rare sight. On the other hand, the scope and proportion of Arab interviewees on various media outlets still leaves a lot to be desired. With 20% of the general population Arabs, having short of 5% Arab interviewees in all leading current affairs programming is, simply put, unconceivable. 2019 is an election year, and along with the changes in the Israeli media map, the time is ripe for correcting and improving the current state of affairs. Executive directors and producers should strive towards improving these numbers, setting a dramatically higher bar of at least 10% Arab interviewees in all leading shows”.